The Solitude racetrack is a former motorsport race track in Leonberg, west of Stuttgart. It is named after Castle Solitude and has hosted various motorcycle and automobile races. 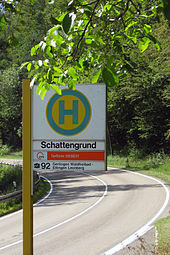 The traditional, used for motorcycle racing track located above the Stuttgart district of Bergheim, but not in the center of the main 11.3 km long variant of the former racetrack. 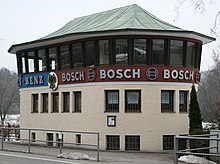 This results from the start-finish-house at today's ADAC training area, on Seehaus over and then on Glemseck at Leonberg and the Steinbachsee on Katzenbacher yard, past the Stuttgart district of Büsnau to the ground and through the shadows Mahdental back to the start and finish before Glemseck. The section of the shadow base to Glemseck runs in the valley of Glemsford. From 1903: First hillclimb track from Stuttgart Westbahnhof up to the Schloss Solitude. From 1906: laid off from Westbahnhof to Heslach. From 1925: circuit with a length of 22.3 km, starting and finishing at the castle. Direction: counterclockwise. From 1931: round course was shortened with the road through the Mahdental. Start and finish was moved to the west. Direction: clockwise. From 1935: Final round course: The 1931 line introduced by the 1931 Mahdental and exuberant form part of the route used by 1965 11.4-km course. Direction: counterclockwise. 2003: Start and finish back at the castle. Drive direction. Only the shortcut through the wildlife park, highway and its access ramp is new. 2011: On the work of the initiatives Solitude-Revival and Retro Revival Classic Culture were out in the Automobile Summer 2011 in Baden-Württemberg for the 125th "Birthday" of the Benz Patent Motor Car the streets that belong to the last variant traffic, closed for the weekend. Many visitors could watch historic racing and sports cars from different eras when biking the route. Thomas Mehne: Racing at Solitude 1949–1965 – The Competition Cars, Petrolpics 2011, ISBN 394030610X. This page was last edited on 4 February 2019, at 23:33 (UTC).